How can I list the GUID of an installed program in Windows? Alternatively, is it easier to find the GUID if I have the MSI file? I'm looking through the MSI file with Orca but not sure where to look to find the GUID. To find them on a machine, you can look in the Uninstall key, where the ProductCode is often used. Or better yet, if you are looking to enumerate what is currently installed on the machine, you can call MsiEnumProducts. There are several ways to locate the product GUID for installed packages. Please prefer option number 3. Check the locally cached MSI package in %SystemRoot%\Installer. This is a cached version of the original MSI that was originally used to install the product on your computer. You will need a tool capable of opening MSI files. Here is a list and comparison of features: What installation product to use? InstallShield, WiX, Wise, Advanced Installer, etc. An MSI is an MS SQL database in disguise, you should also be able to open it with any compatible MS SQL data viewer tool. The free MSI tool "Orca" from the Windows SDK is the preferred one for this simple data retrieval task. It is quick, small and reliable. Then follow Michael Uhrman's advice from his answer above, and locate the package code in the summary stream, and the upgrade and the product code in the Property table. 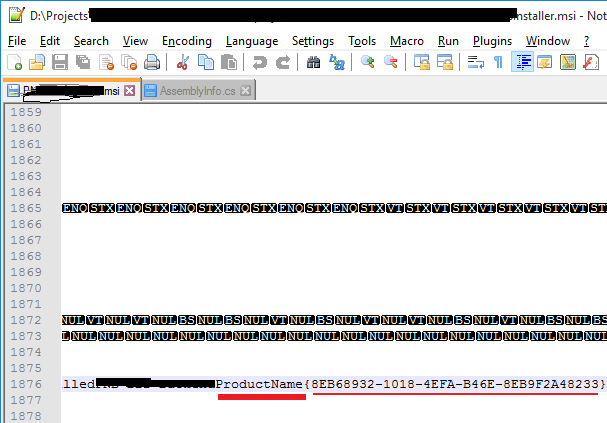 The package code is also visible from an MSI file's property page in Windows Explorer. Use Powershell to list package information. I find this the easiest and most practical option. See this answer for a screenshot and a sample: How can I find the product GUID of an installed MSI setup? Typically (though not universally) if a piece of software uses MSI-based installation the GUID can be found in the Uninstall entry. It will usually either be the key name or will appear in the UninstallString and/or UninstallPath value. Sometimes life is easy and there is a ProductGuid value. Not the answer you're looking for? Browse other questions tagged windows windows-installer guid or ask your own question.